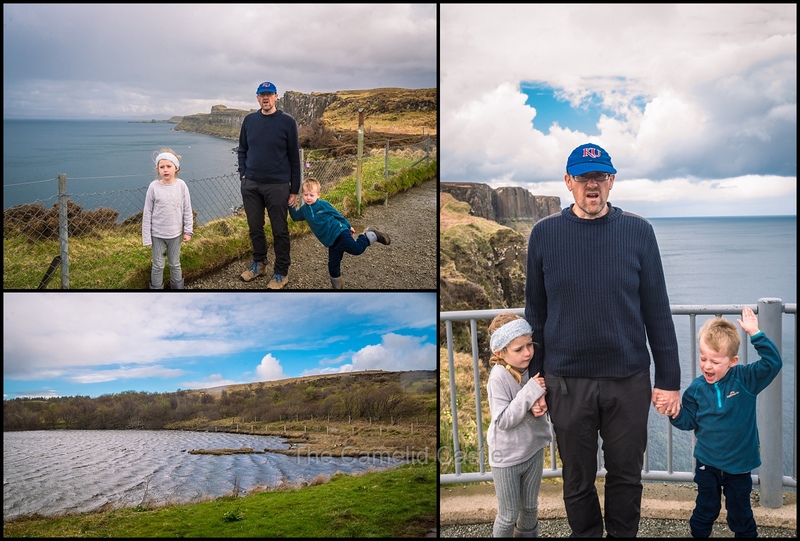 It was yet another spectacular day of scenery in the Scottish Highlands, as we managed to explore bits of the amazing Isle of Skye between rainy downpours. 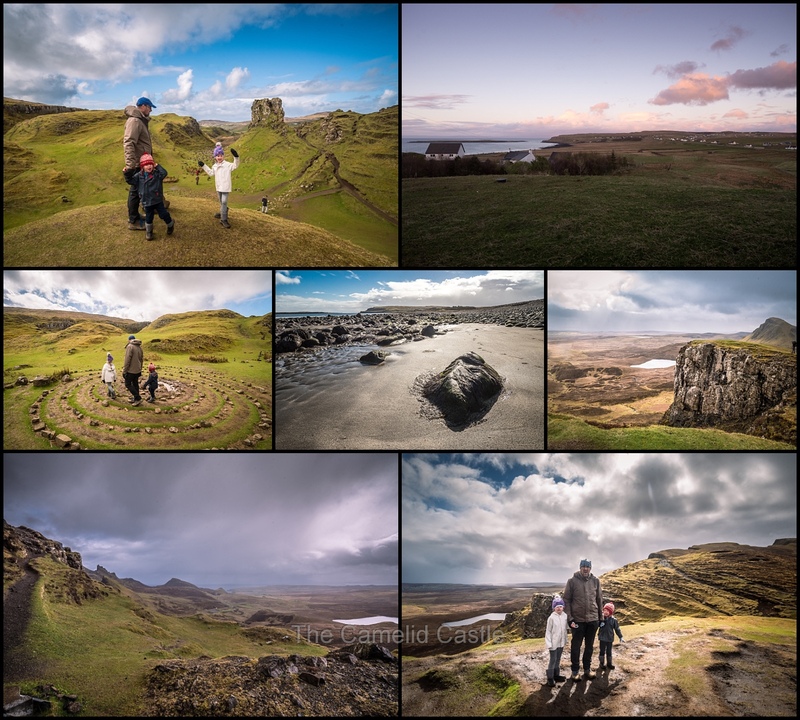 We started with a hunt for fossilised dinosaur footprints on the Staffin black sand beach, then hiked the famous and beautiful Quiraing. 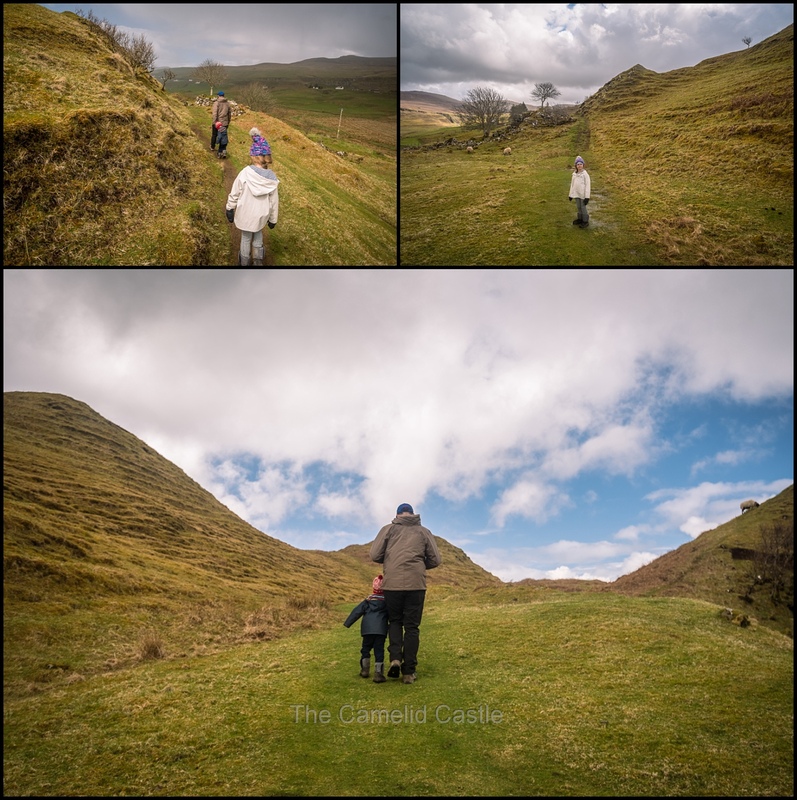 The afternoon took us to the magical Fairy Glen, one of my favourite places of the whole trip! Then we finished the day off with a visit to the Kilt Rock and Mealt Waterfall and the Staffin Dinosaur museum. Despite our amazing Airbnb cottage having the comfiest beds of the entire trip, the kids woke up at 6.30am! Just when we were looking forward to a sleep-in with having had a late night getting to Skye and everyone being tired. Anto whipped us up some bacon and eggs for breakfast as we watched the sheep and their cute lambs bleeting as they wandered the paddocks around the cottage. We’d thankfully woken up to less rain than the night before. It was still a bit grey but we could at least see the sky and the beach from the windows. 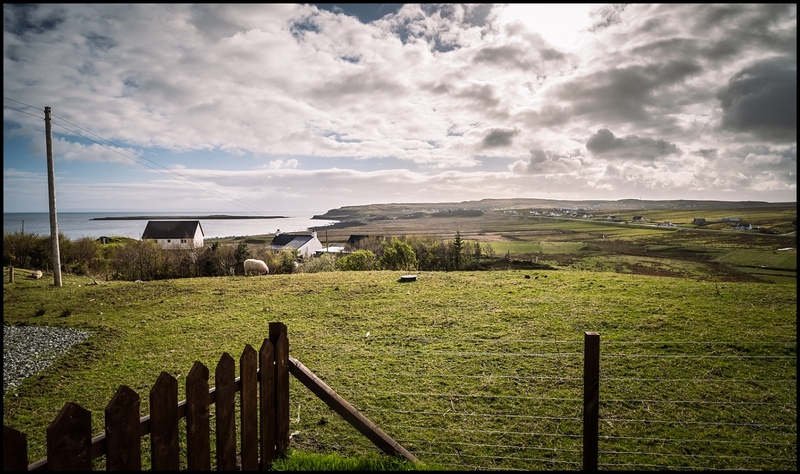 Despite the temptation to stay in the beautiful cottage all day, relaxing by the fire and admiring the view, we really wanted to see some of the Isle of Skye while it wasn’t actively raining! Seemingly that is an infrequent occurrence in Skye. 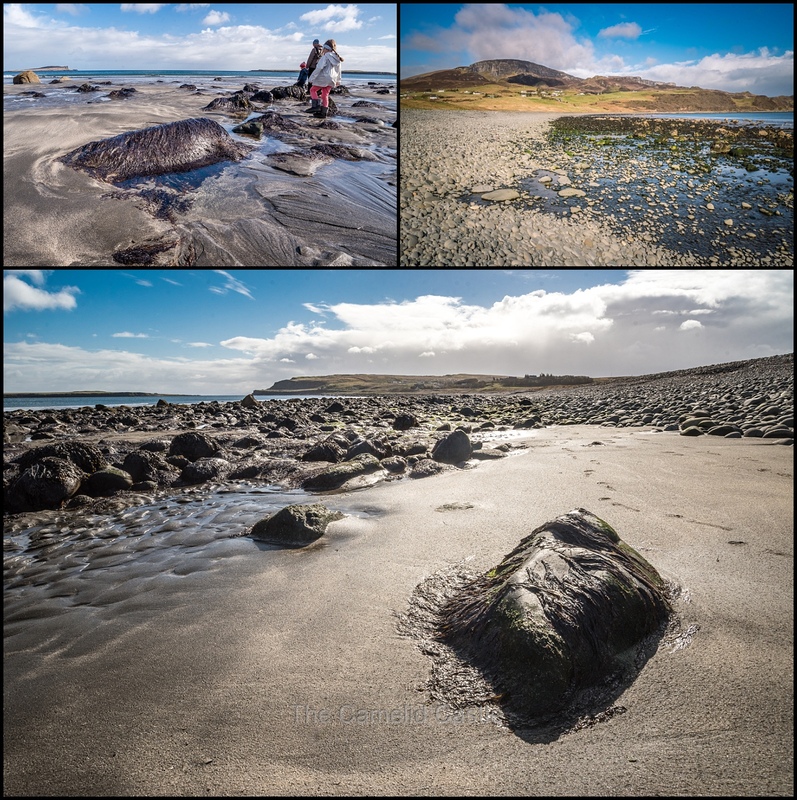 The beach nearest to the cottage was home to the well-known Staffin dinosaur prints (fossilised dinosaur footprints). They can only be seen at low tide. Luckily the tide was out that morning so we decided to walk down and see if we could locate them. The path from the cottage to the beach was both rocky and muddy. Soren managed to face plant in mud within a couple of minutes and was pretty quickly entirely covered in mud. Once we got to beach, we discovered it was comprised of huge rocks and was very hard to walk on. It was rather pretty but very hard work walking without slipping or twisting an ankle. 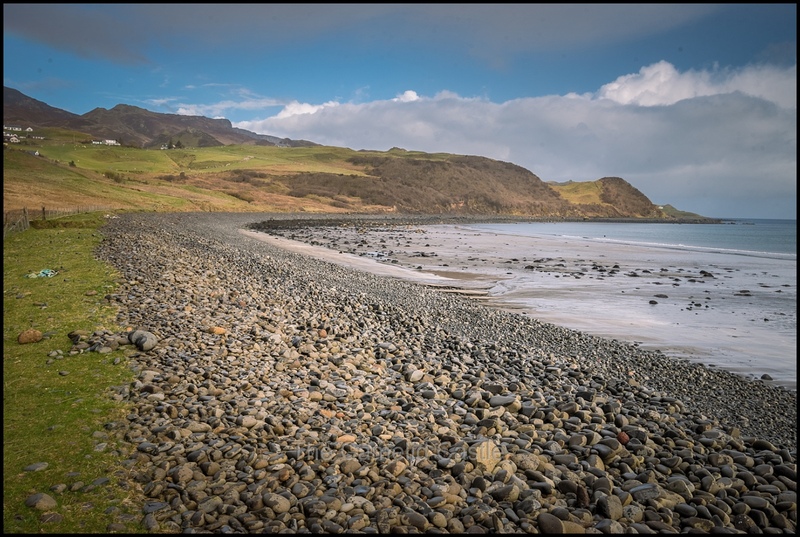 We walked along the rocky beach for around 15 minutes but didn’t even get a quarter of the way to the dinosaur prints as it was hard and slow going. At the pace we were travelling we figured it was going to take 2 hours to get there and back, someone would break an ankle, and the tide would be in before we got back to the cottage! 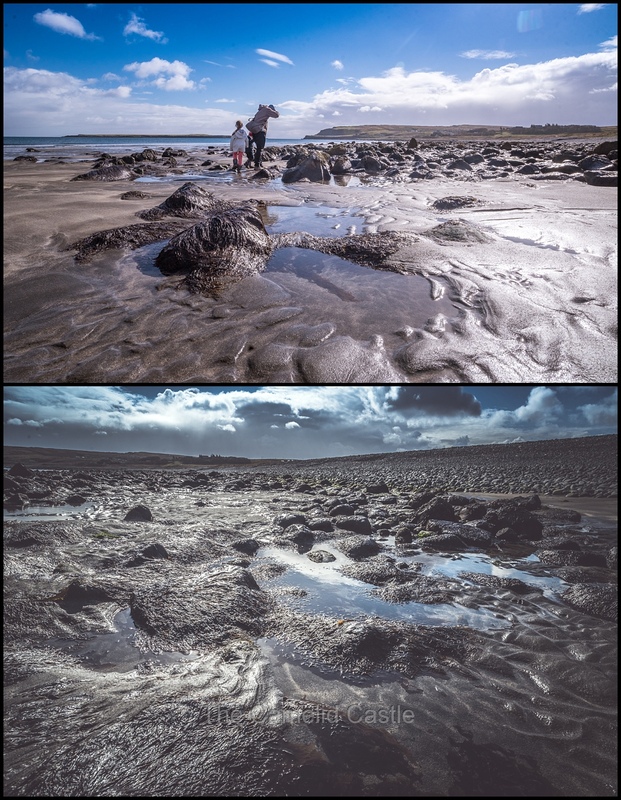 We placated an upset Soren, who’d been looking forwards to the dinosaur prints, with looking in the many rock pools scattered all around the beach. 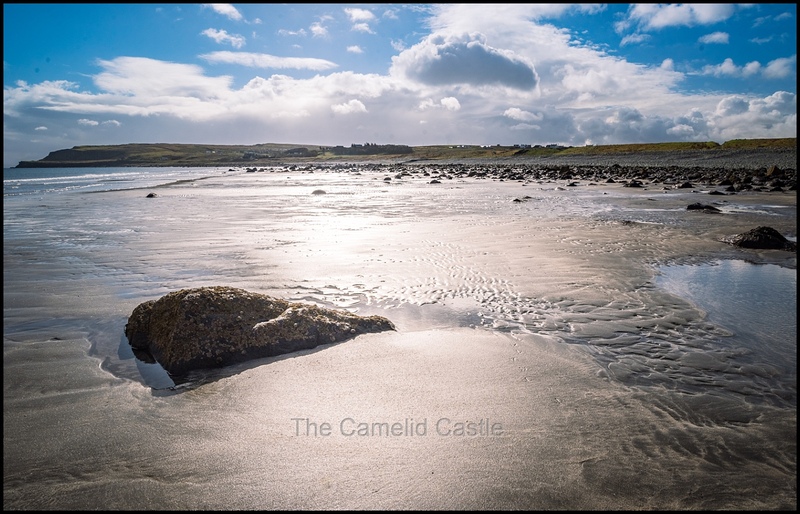 The black sand beach with the sun shining on the rock pools and seaweed was rather pretty with the tide out. 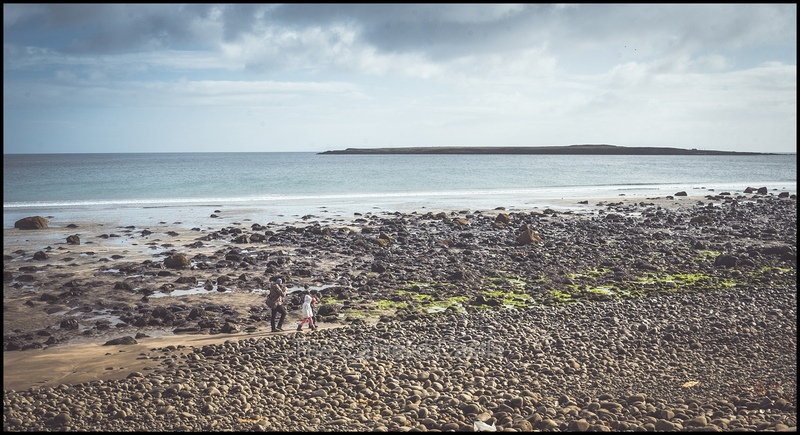 We found plenty of interesting sea creatures in the rock pools and the kids were reminiscing about the many black sand beaches we visited in Iceland just a couple of weeks prior! After a good explore of the beach, but no dinosaur prints, we walked back up to the cottage, tracking through more mud. There were plenty of sheep hanging out chewing on their plentiful grass, and probably enjoying their brief respite from the rain. When we arrived back at the cottage we changed both kids into less mud-soaked clothes. An exercise that proved to be somewhat pointless. 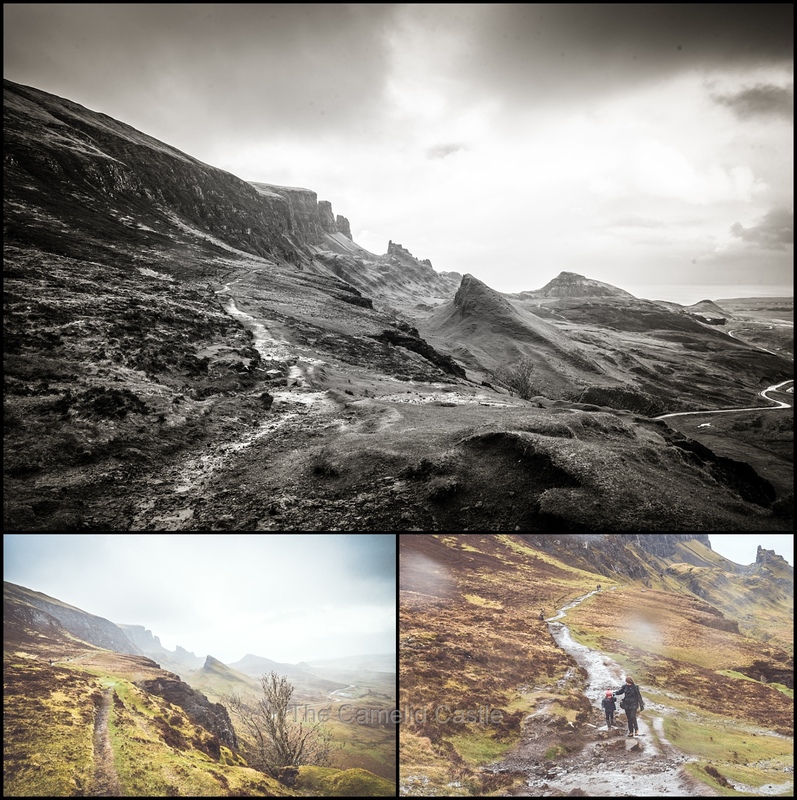 While the weather was still acceptable we decided to try to walk Quiraing. 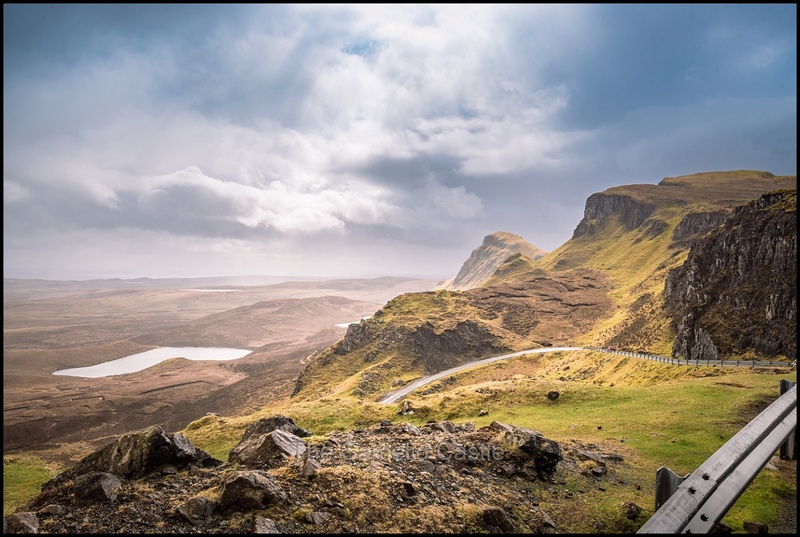 The Quiraing is a landslip on the eastern face of Meall na Suiramach, the northernmost summit of the Trotternish (the Northern most peninsula on the Isle of Skye). 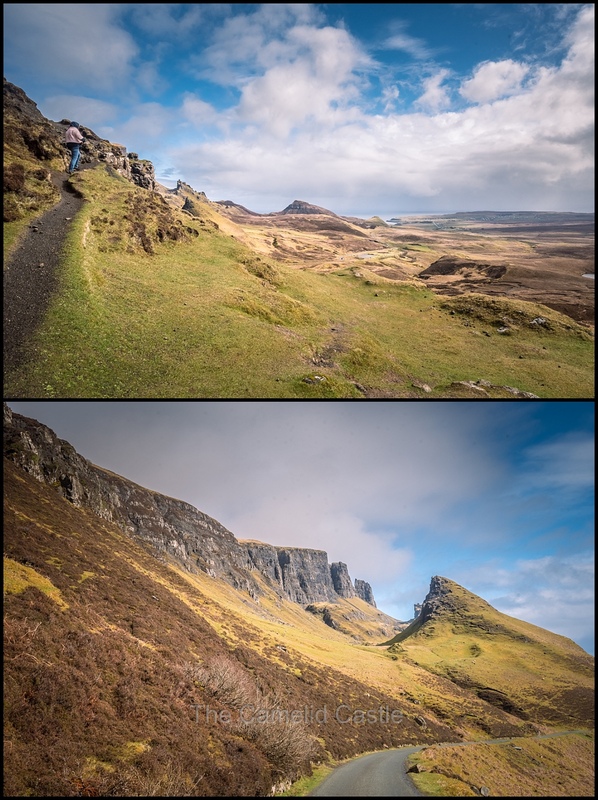 The massive landslip has created high cliffs, hidden plateaus and pinnacles of rock.The whole of the Trotternish Ridge escarpment was formed by a great series of landslips and the Quiraing is the only part of the slip still moving—the road at its base, near Flodigarry, requires repairs each year. 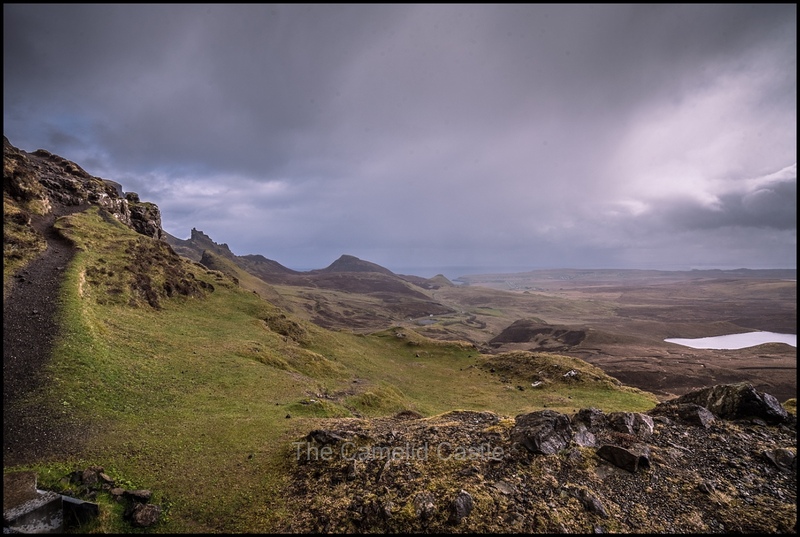 The turn off for the road up to the Quiraing is opposite the cottage. It was, however, a 2.4 mile steep and narrow drive up to the top car park. In typical Scottish style the road was single lane, narrow, steep, winding and full of pot holes. The drive up took quite awhile as we had to keep stopping to let cars pass in the opposite direction (often involving reversing down the road to find a safe place for over-taking). Luckily the stunning views made up for it. 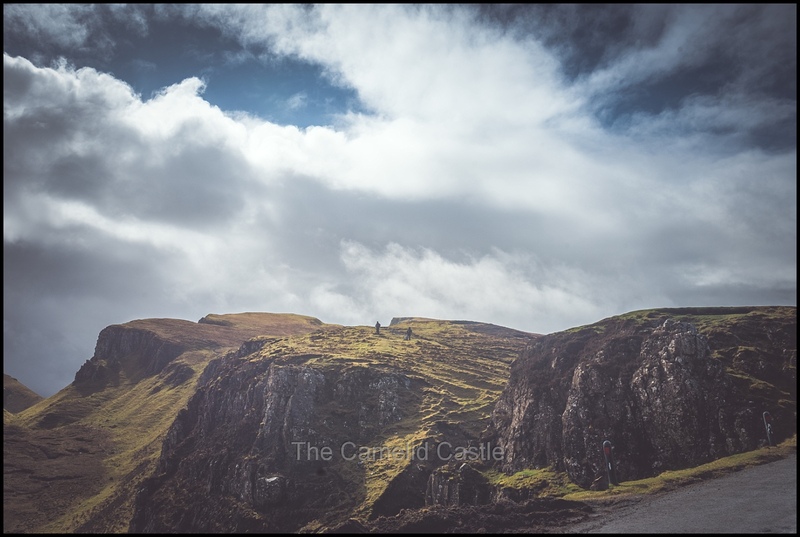 The Quiraing walk is a 6.8km loop, with an average time to complete of 2 hours and a rating of ‘hard’ due to the high cliffs and narrow paths. We weren’t sure how far we’d get with the kids and the weather, but thought we could walk for a bit and then back track. 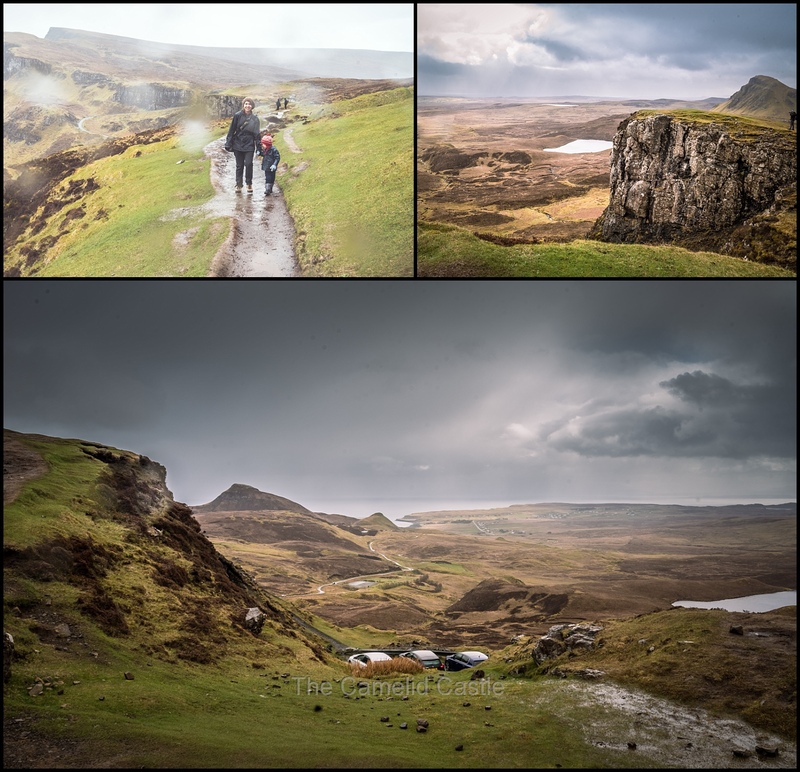 As we set off the views were amazing but the weather conspired against us with strong winds and sleet directly into our face. We had to lift the kids over the run offs of water and large muddy patches. At least at the start of the walk there were sheer drops to one side of the track, which was more like a goat-track than an actual path. It would have been awesome to do whole walk but it was absolutely freezing even with gloves, coats and hats on and the sleeting rain was rather unpleasant. 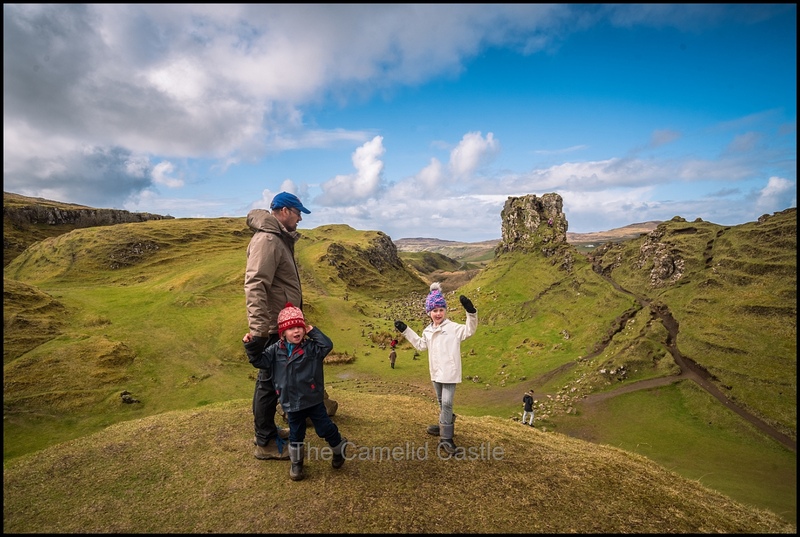 The track was relatively safe for adults but it wasn’t worth the risk with the kids. So, given the miserable conditions we walked for around 750m and then turned around as the mud and driving rain were getting worse. If the weather had have been more cooperative and there was less wind and mud it would have been fine with the kids. Unfortunately when we turned around the sleeting rain was right into our face again and made any photography virtually impossible. Thank goodness for a weather sealed camera! Just as we got back to the car park the sun came out briefly, giving us these amazing views. It was still freezing though – I guess you can’t have everything! We had nice views on the way down the mountain but again the short drive took forever as we had to stop multiple times. It started raining again on our drive back so we were glad we’d opted to leave. Of course our short hike had resulted in the kids being entirely covered in mud again, but we gave up and just changed to clean pants inside and put the dirty ones aside for going back out. It seemed likely there would be more mud later in the day. All rather soaked and cold when we arrived back at the cottage, we warmed up by the fire and had some lunch while watching the sheep and storm clouds through the windows. 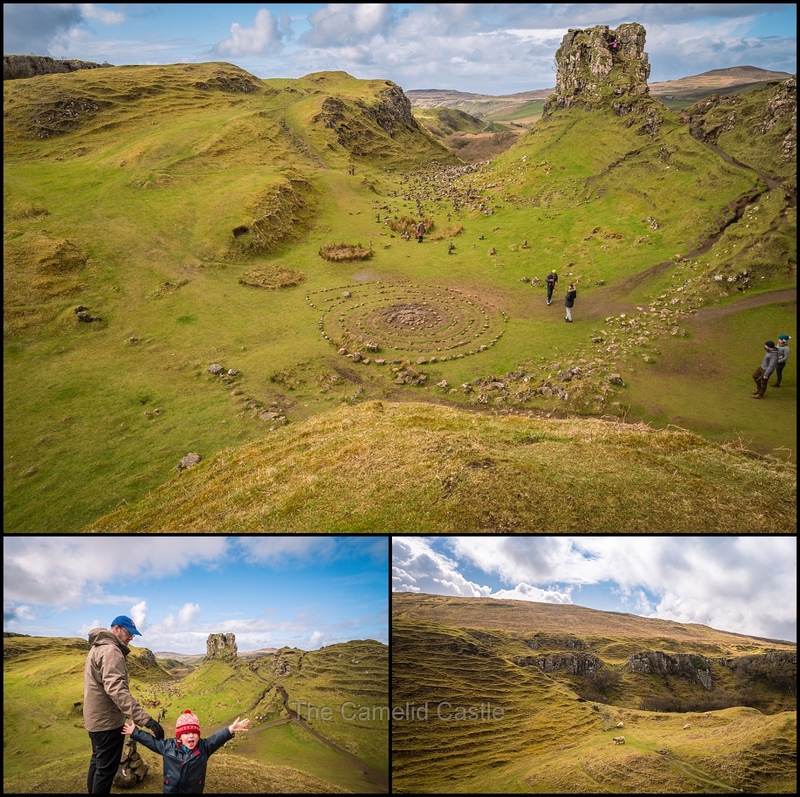 When we finished lunch the sun was back out again so we decided to make the most of it and visit the ‘Fairy Glen’ which is on the West side of Trotternish at Balnacnoc (which means – the village or township in the hills) above Uig. 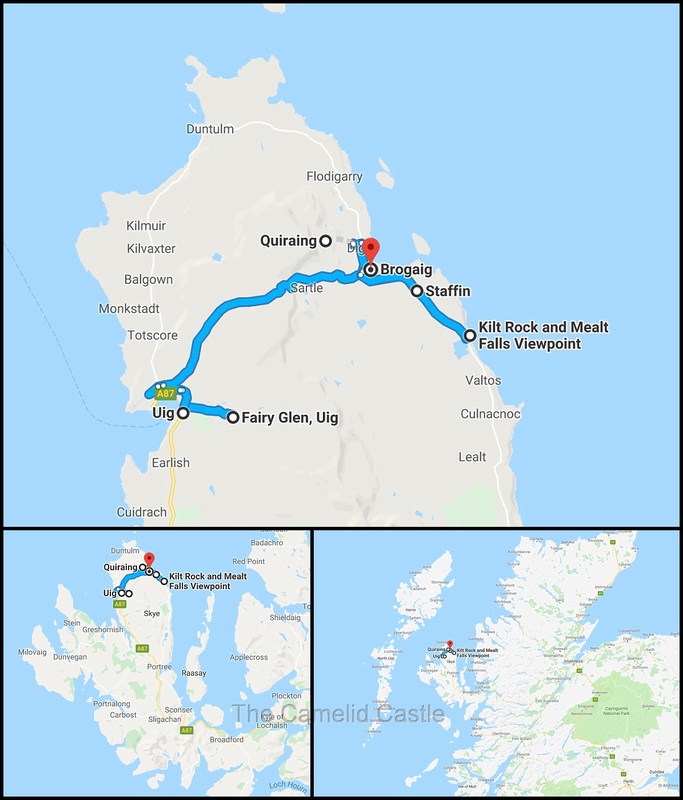 According to google maps it was approximately a 12 mile drive, and we had assumed, looking at the map, it was the road heading north, past the cottage. 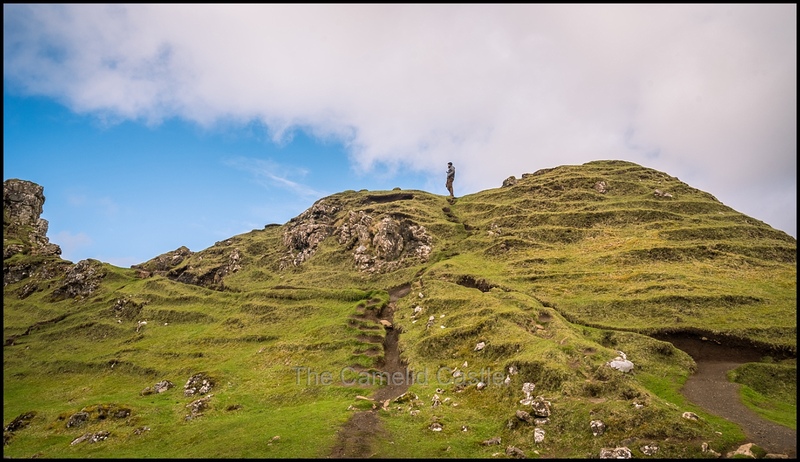 It turns out it was actually back over the mountain past the car park for the Quiraing walk. 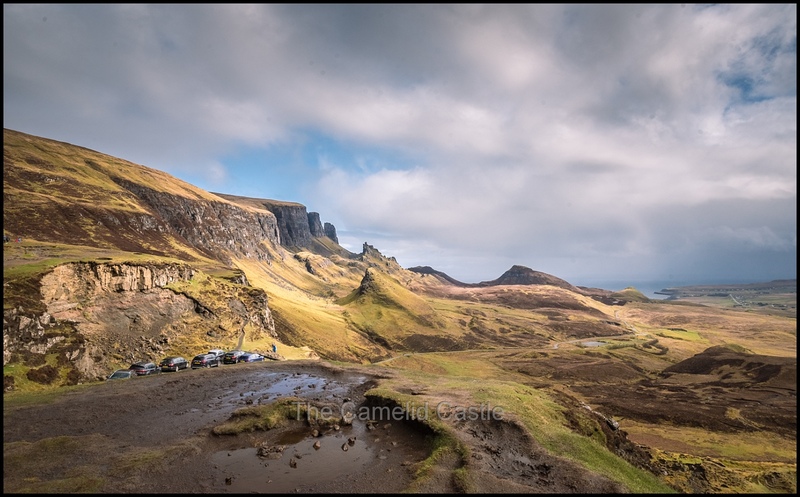 So, up the mountain we drove, again taking ages to even get to the Quiraing car park having to let people past. We then had to continue on over the top of the mountain and down the other side. We could definitely see why this road is closed through the Winter! 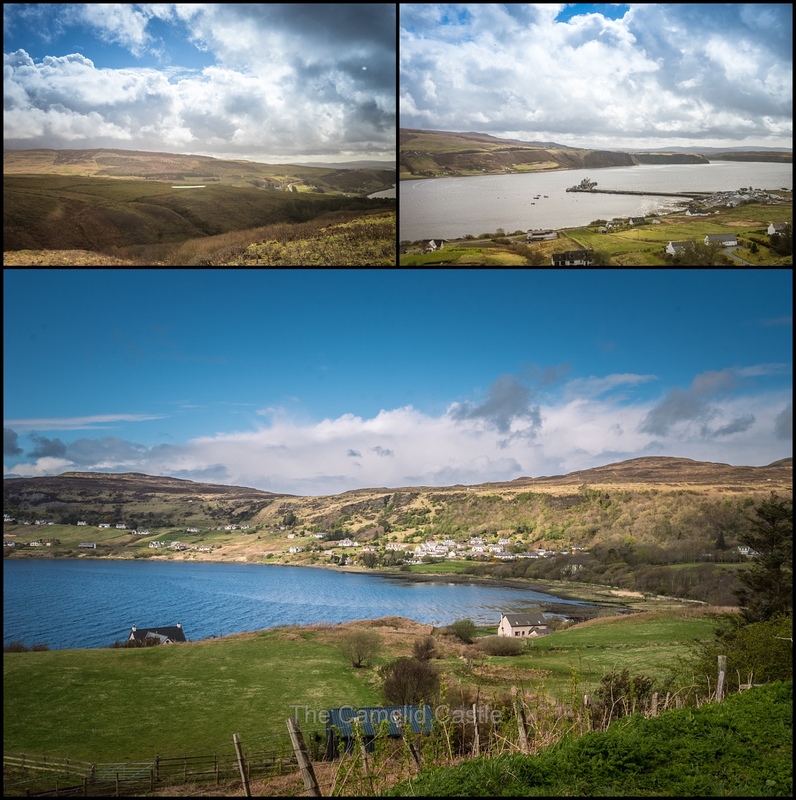 There was at least some stunning views over the harbour as we headed into the village of Uig, making up for more tedious and winding driving. The rather tired kids had managed to nap on the short drive over the mountain. 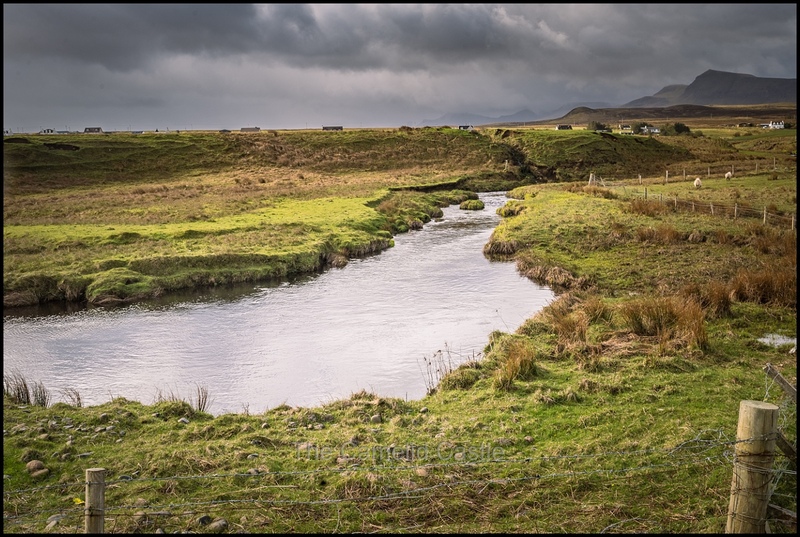 We had to drive past Uig and up the next mountain towards Fairy Glen. There was less traffic over this side of the mountain making it a slightly easier drive. 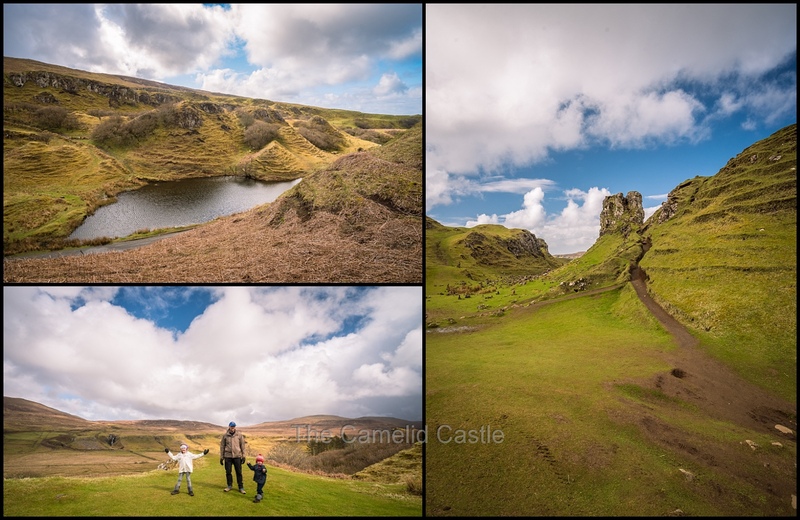 I’d been hanging out to visit the Fairy Glen, a Quiraing-like landslip in miniature. 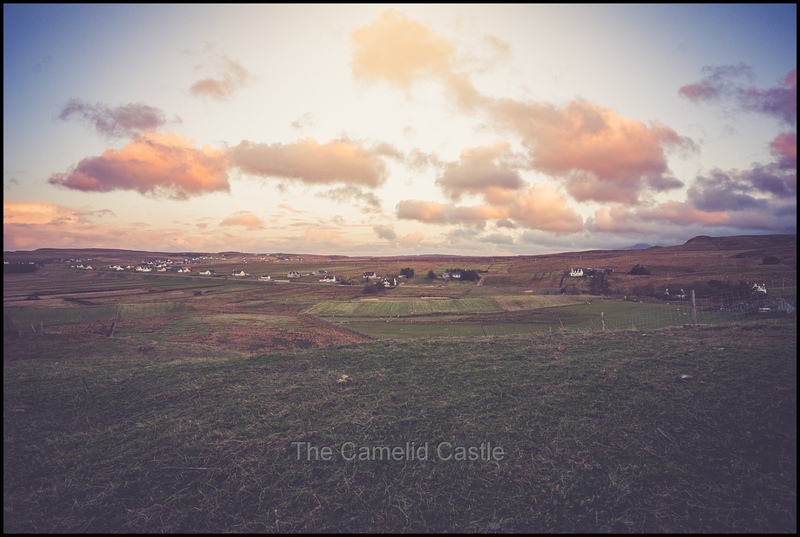 The road winds around small round-topped grassy hills with lochans (ponds) in between which gives the glen an otherworldly feel. 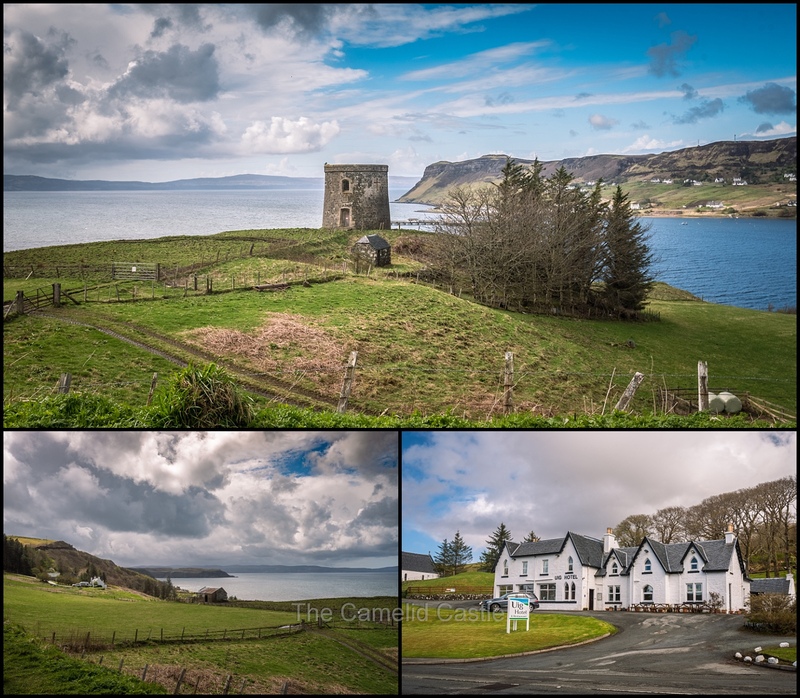 Skye has a long history involving the Fairies, most of which is related to Dunvegan Castle and their ‘Fairy Flag’. 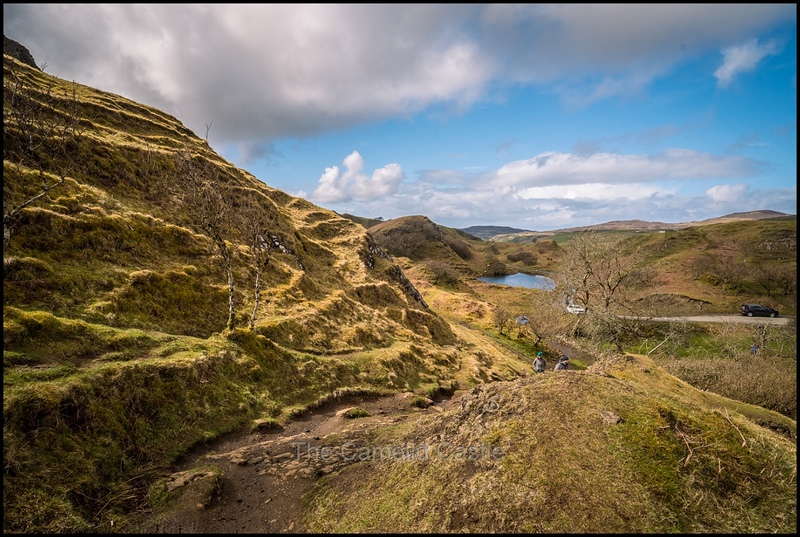 The Fairy Glen has no real legends or stories involving fairies that can be traced. 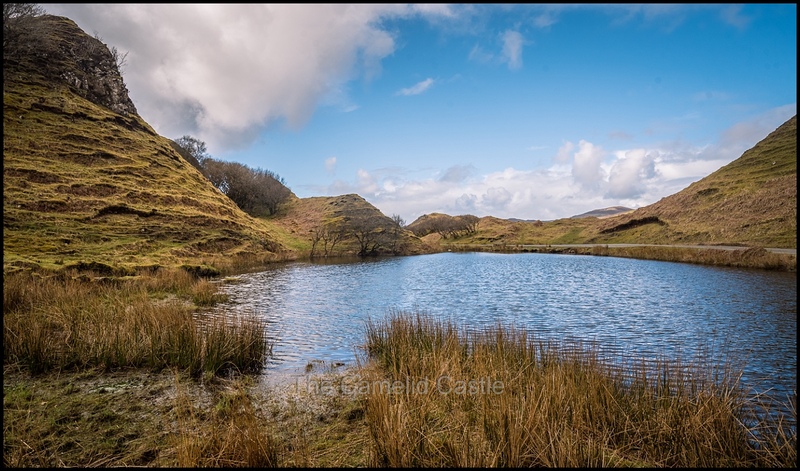 The simple fact that the location is unusual so it has been given the nickname Fairy Glen. 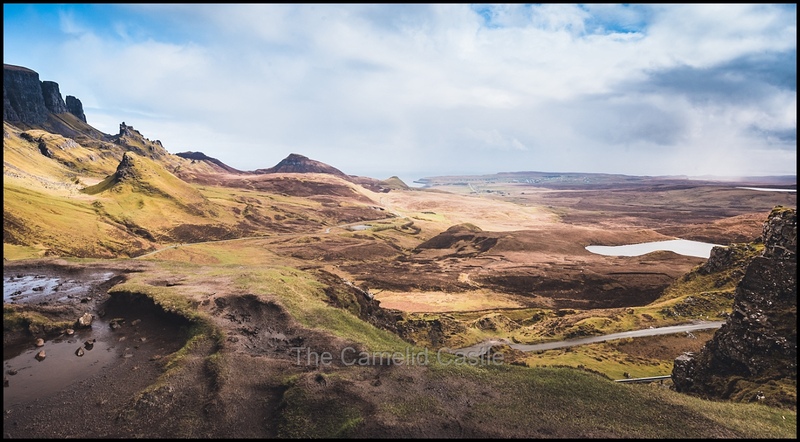 Parking here was slightly easier there than Quiraing, although there were still plenty of people wandering around. 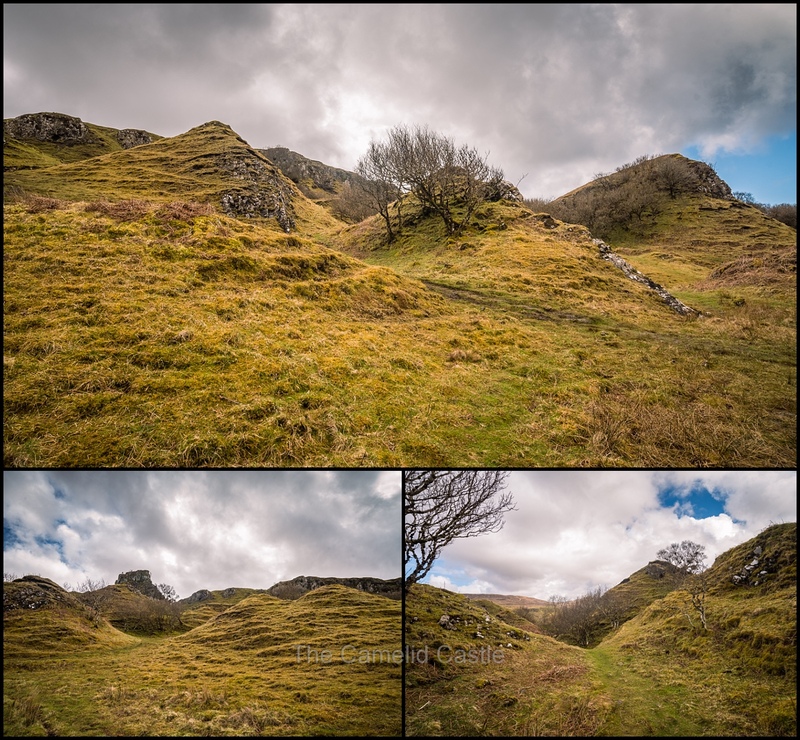 There is no defined walk around the Fairy Glen so off we set to explore the landscape. The Glen was full of bizarre trees, and weird little mountains covered in grass and rocks. 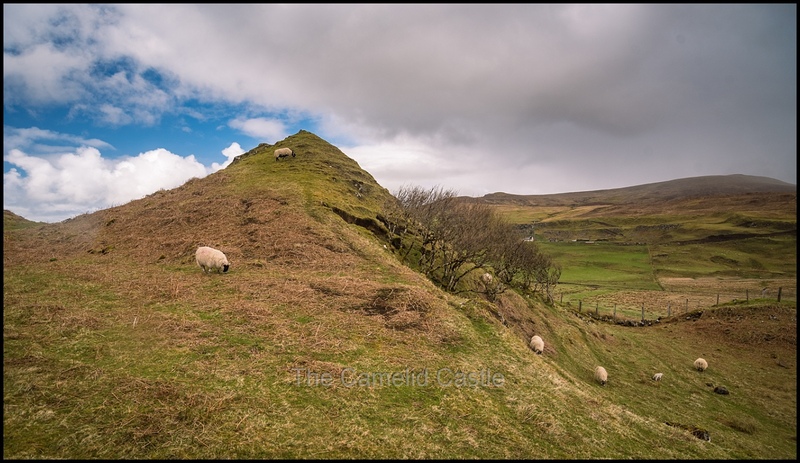 Sheep were wandering all through the Glen and happily climbing up the small mountains. We wandered along different paths exploring. Some sections were rather steep and muddy, making it hard work walking up and the sheep were seemingly having an easier time of it than us. It was rather beautiful and definitely somewhere fairies might live! We climbed to the top of several of the hills and were quickly all covered in mud! It was definitely worth it for the spectacular scenery. 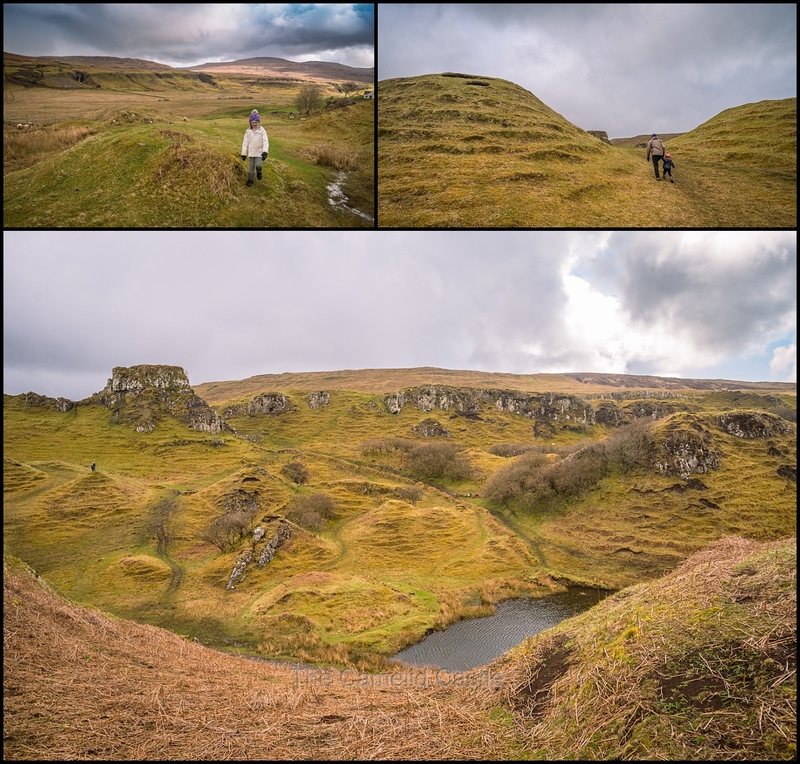 There were so many pretty sections of the Glen to explore that we wandered for a while, glad to be out of the wind in the protected hills. We lucked out with the weather as it had stopped raining while we were there, but was still rather chilly. 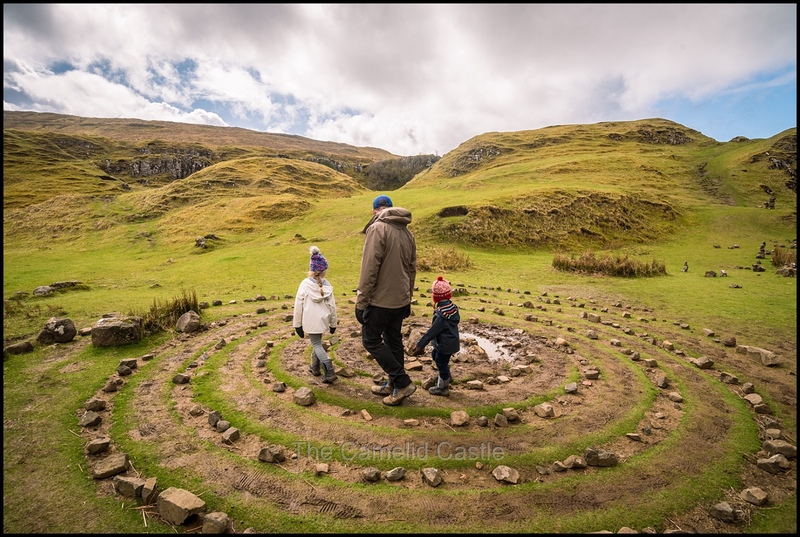 In recent years visitors have apparently been moving rocks to create stone spirals and leaving coins at the centre for the fairies for good luck. Apparently the Skye locals are not impressed by this feature so we didn’t add any stones, although they did look rather magical in the landscape. 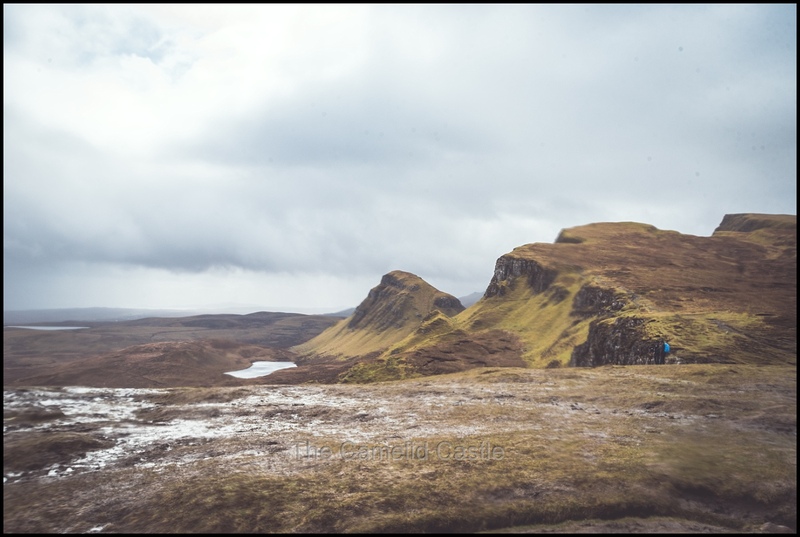 For what seemed like the umpteeth time that day we went back over the mountain towards Quiraing, caught in a slow procession of small tour buses. The tour buses were all mini-van sized, probably because large coaches would not make it up and down those mountains on the narrow roads. 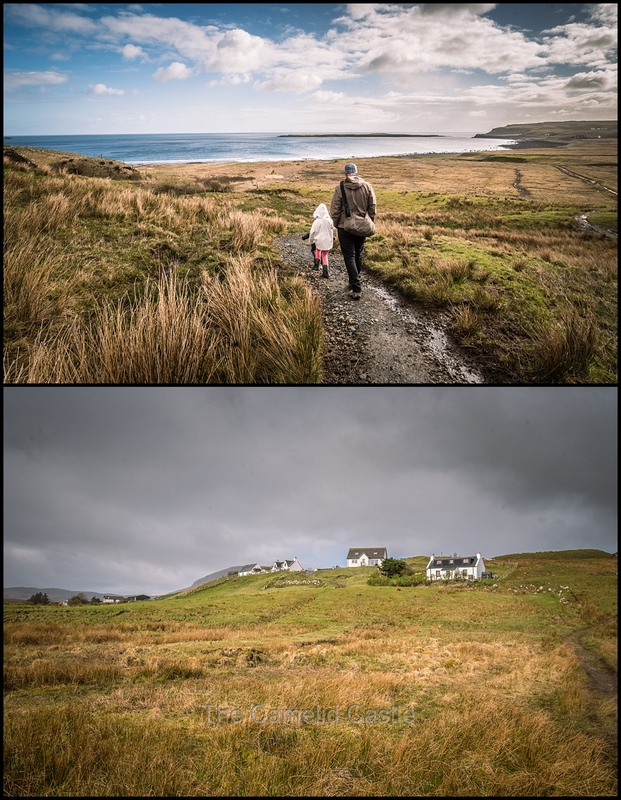 As we reached the other side, the weather was holding out and we decided to head past the cottage and down the road towards Kilt Rock. 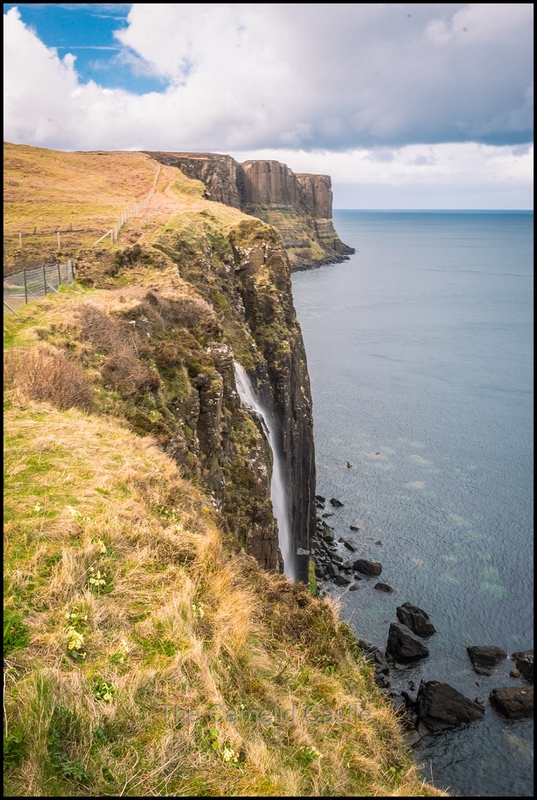 The famous Kilt Rock is a sea cliff in north-east Trotternish. 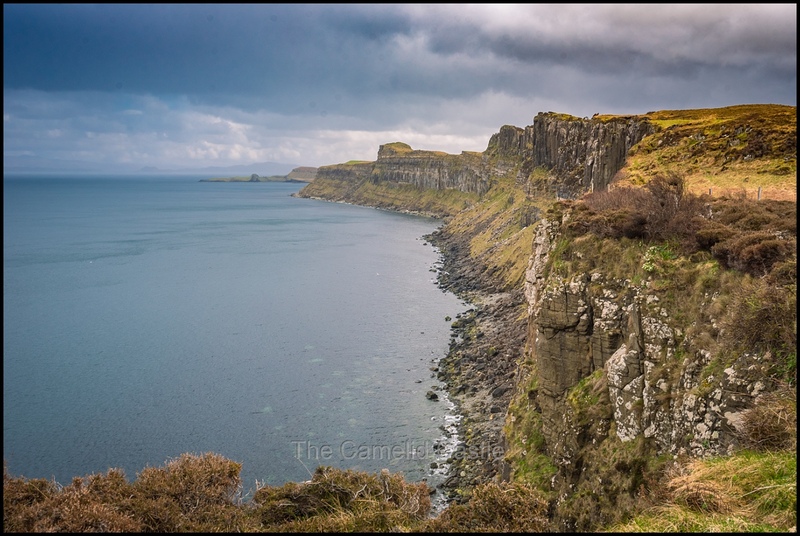 It is said to resemble a kilt, with vertical basalt columns to form the pleats and intruded sills of dolerite forming the pattern. 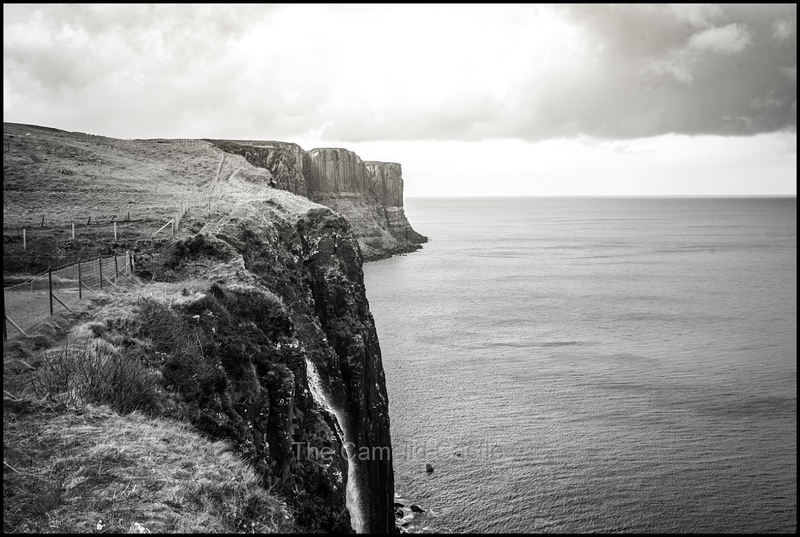 The car park for Kilt Rock was both large and blessedly close to the lookout. 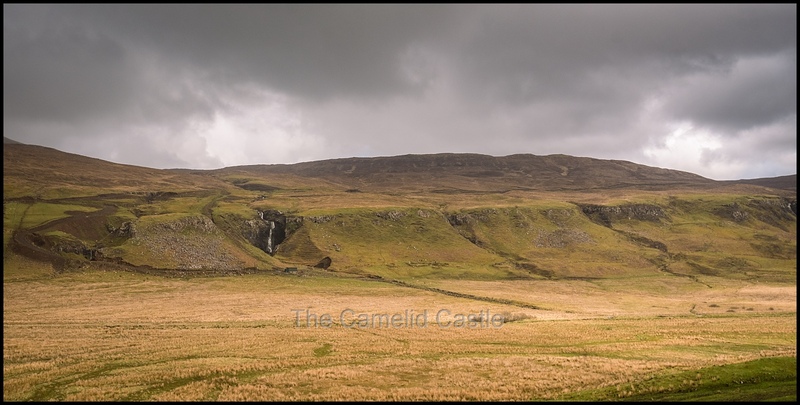 From lookout you can see the Mealt Waterfall, which freefalls off the cliff for 60m into the Sound of Raasay below. Apparently, when the wind is strong, the water is blown away and it doesn’t reach the bottom at all. The wind was certainly strong and we were all freezing! The kids were pretty much over being outside by this point of the day. 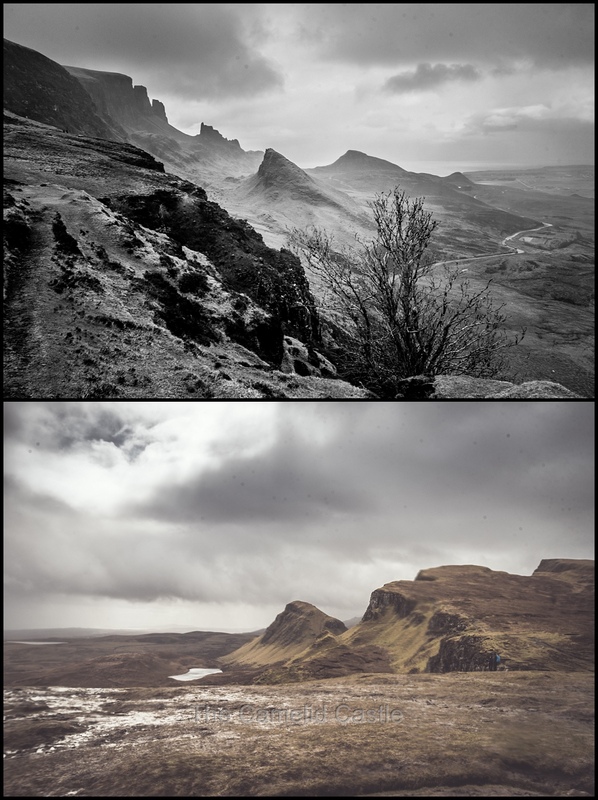 We all did notice how similar the Skye geography and rock formations were to Southern Iceland. Once again raining, we hustled back to the nearby car and decided on one last stop for the day. 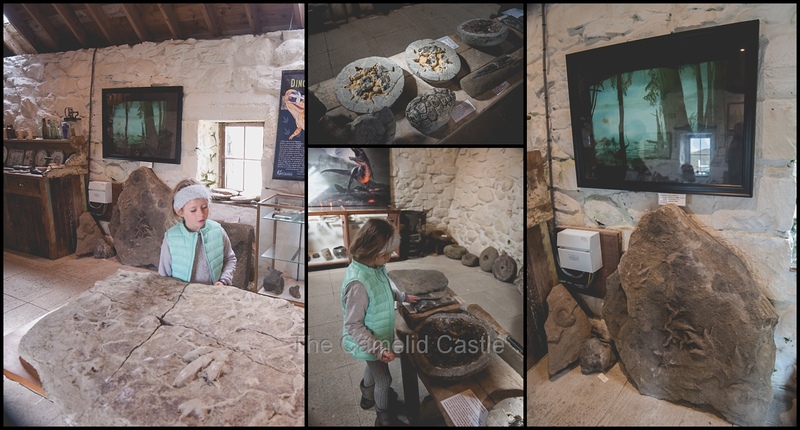 Since we hadn’t managed to see the dinosaur footprints that morning on the beach we headed to the nearby Staffin Dinosaur Museum. The museum contains fossils of species identified in the area including Stegosaurus, Megalosaurus, Cetiosaurus, Hadrosaurus, and Ceolophysis and other rocks and artefacts. The kids now satisfied they had seen something dinosaur related, we made the short drive back to the cottage as it was now around 4pm and we were all tired and cold. The kids enjoyed some down time colouring in, writing on post-cards and watching TV in front of the fire while the adults caught up on washing, drank coffee and watched the sheep (and bumble bees) surrounding the cottage. 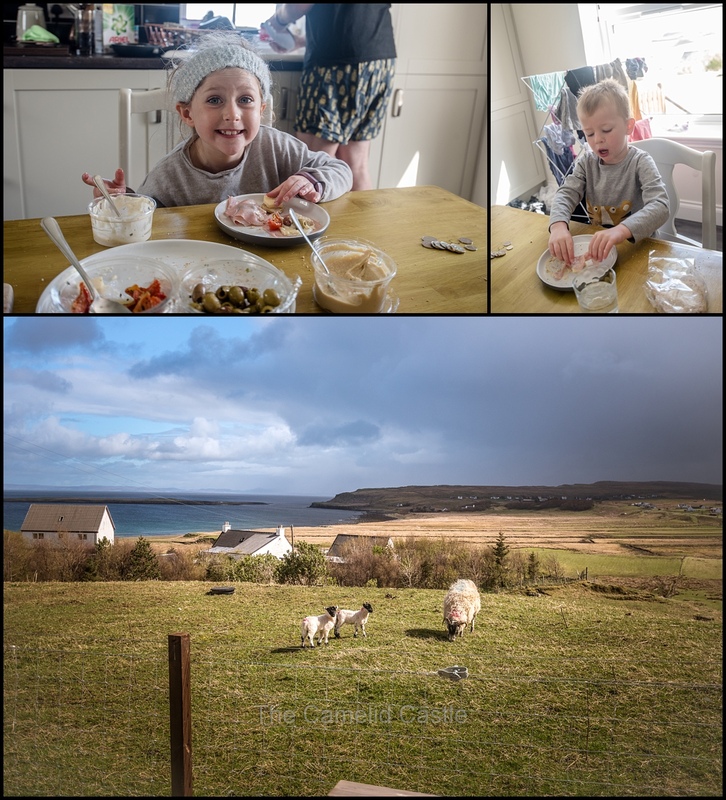 We rustled up dinner of scotch pie, cheese and onion quiche and salad (and local Skye beer for Anto), before convincing the kids they needed an early night for once! 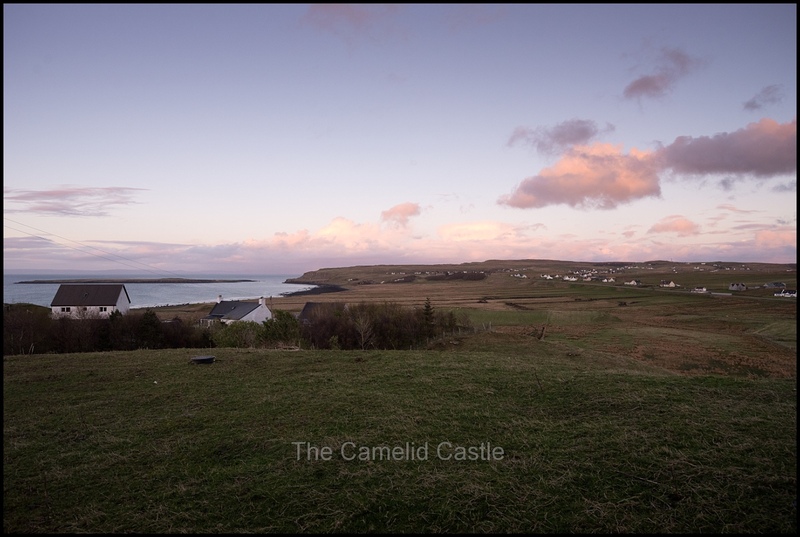 We succeeded in having them in bed by 6.30pm, although they refused to go to sleep straight away, instead wanting to watch the sheep and setting sun. Admittedly it was a very pretty end to the day, and definitely a good excuse to get out of sleeping! 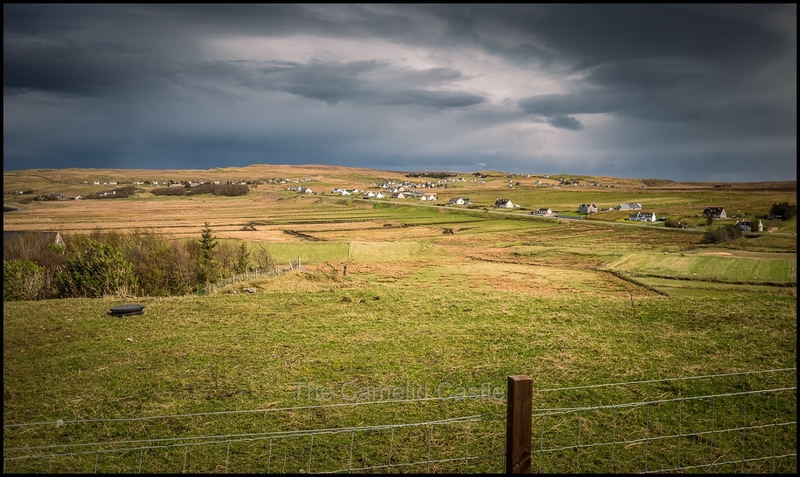 Statistics for Tuesday the 24th of April 2018, in the Isle of Skye, Scotland……. The temperature range for the day was 6 to 11 degrees, with a mean of 8. It was both incredibly windy and raining on and off most of the day, making it feel somewhat colder! 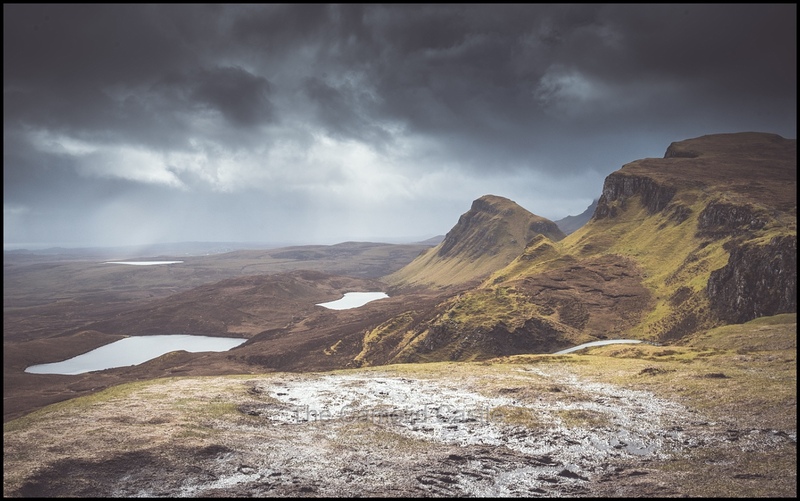 Up next, we depart the beautiful (if rainy) Isle of Skye and head back to Glasgow through Fort William, Fort Augustus and Glen Coe. 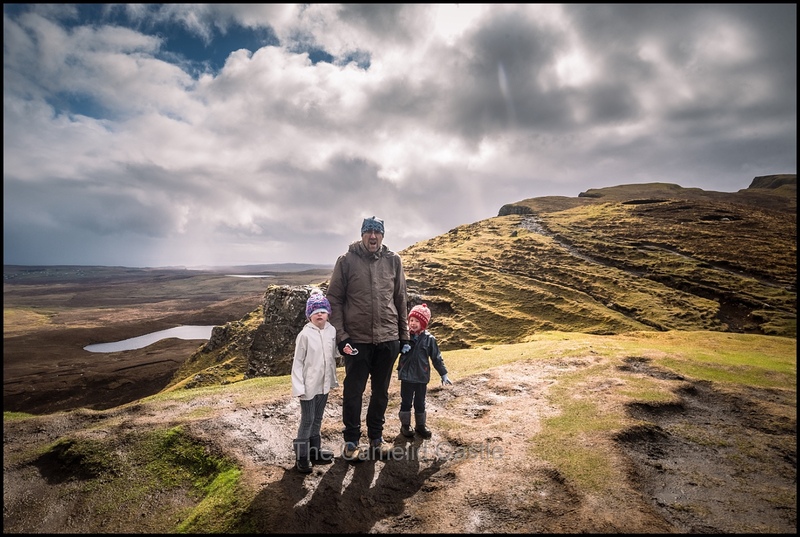 Finishing off our time in both the Highlands and Scotland………. 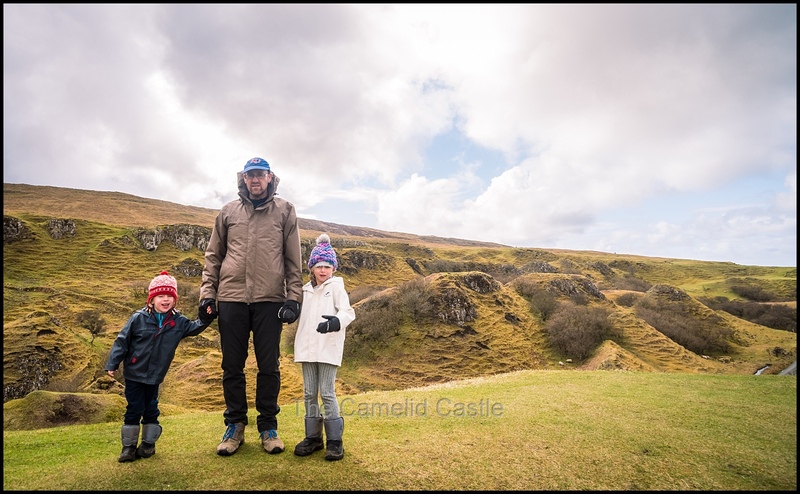 Posted in 4 years, 6 years, Anto, Astrid, beach, black sand beach, dinosaur, dinosaur museum, Fairy Glen, Isle of Skye, Kilt Rock, Quiraing, Scotland, Scottish HIghlands, Soren, Staffin, sunset, Travel, travelling with kids, UK, waterfallBookmark the permalink.